The Japanese military is purportedly also mulling the purchase of F-35Bs, according to sources. Japan is interested in procuring at least 20 additional ready-to-fly F-35A stealth fighter jets from U.S. military aircraft maker Lockheed Martin over the next six years, according to three sources familiar with the Japanese Ministry of Defense (MoD) acquisition plans. Japan has been mulling the purchase of additional F-35As for some time. As of now, Japan has budgeted the induction of 42 F-35As. In January, the Japan Air Self Defense Force (JASDF)deployed its first F-35A at Misawa Air Base in the northernmost part of Honshu. While the first batch of four F-35As were all built in the United States, the remaining 38 F-35A aircraft are currently being assembled at the Mitsubishi Heavy Industries (MHI) F-35 Final Assembly and Check Out (FACO) facility in Nagoya. Japan’s F-35A program has (…) been plagued by cost overruns. “The procurement was estimated at 9.6 billion yen ($88.5 million) for a single plane as of fiscal 2012, but the price tag rose to 17.9 billion yen in fiscal 2016,” Nikkei Asian Review reported on January 27. “Total estimated costs until disposal also increased to 2.22 trillion yen in fiscal 2016, up 16 percent from the fiscal 2012 forecast.” Part of the reason for the higher than expected expenditures is a weaker yen, there are other factors including higher assembly costs at the FACO facility in Nagoya. Japan’s defense industry has also repeatedly pointed out that although the aircraft is assembled in Japan, it does not contain any Japanese-made parts, which has caused some misgivings in industry and government circles. The sources also indicate that the Japanese MoD is interested in purchasing the F-35B–the U.S. Marine Corps variant of F-35 Joint Strike Fighter capable of vertical or short takeoffs and vertical landings without requiring a catapult launcher–for service on Japanese-held islands skirting the East China Sea or aboard Izumo-class helicopter carriers. However, operating the F-35B from the flight deck of an Izumo-class carrier would require substantial modifications to the warship’s flight deck and would also be politically sensitive as it would significantly boost the carrier’s capability to conduct offensive operations. The recent news of a follow-up order is perhaps a first indication that Japan and Lockheed Martin are considering collaborating on a domestically designed and produced fifth-generation air superiority fighter for the JASDF. In 2016, Japan unveiled an experimental fifth-generation fighter technology demonstrator, dubbed X-2 “Shinshin” (formerly the ATD-X), which is intended to serve as the basis for the JASDF’s so-called (F-3) Future Fighter Program. Lockheed Martin has been involved with the project in some capacity. The follow-up order of 25 F-35As could perhaps be part of a Japanese strategy to convince Lockheed Martin and the U.S. government to share fifth-generation aircraft technology with Japan’s defense industry. The Japanese government is expected to award a contract for the procurement of up to 100 new fifth-generation air superiority fighter in the summer of 2018. The future defense contract will be worth over $40 billion. So far, U.S. aircraft maker Boeing has expressed interest in bidding for the contract along with the Eurofighter consortium and Swedish defense contractor SAAB. 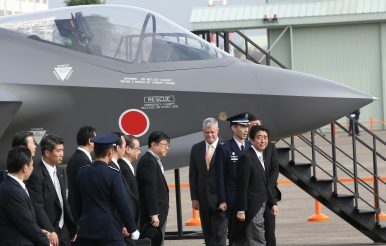 As I pointed out repeatedly, the F-35A right from the beginning was always seen as a stopgap measure by the Japanese government to bridge a shortage of fighter aircraft as older JASDF airframes will slowly be phased out over the next decade. Japan was originally interested in procuring Lockheed Martin’s F-22 Raptor, but the U.S. government refused to grant an export license. Japan now, in collaboration with Lockheed Martin and other international partners, could aim to build a (pricier) domestic variant of the F-22.